A politically connected, longtime board member at the Falls Church, Va., based Dar al-Hijrah Islamic Center effusively praised the Muslim Brotherhood in a Facebook posting Wednesday. Esam Omeish was forced to step down from a state immigration commission by then Virginia Gov. Tim Kaine in 2006 after video of him praising Palestinians for fighting the "jihad way" became public. He also served as president of the Muslim American Society (MAS), a group founded by the Muslim Brotherhood in America. While MAS officials denied that connection, Omeish praised the Egyptian-based organization with ultimate designs on a global Islamic state. "We have not known of the people of Islam ... those more just in understanding, wider in approach and closer in application than the Muslim Brotherhood," Omeish wrote. "We have not known of humane brotherliness and its people, (and we are affiliated with all men whom Allah has created a propensity for love, mercy, an upright disposition, good morals and honorable character) better in ethics, of gentler parts, deeper in adherence to duty, nobler in morals among all their sons, and everyone of their actions than the Muslim Brotherhood." 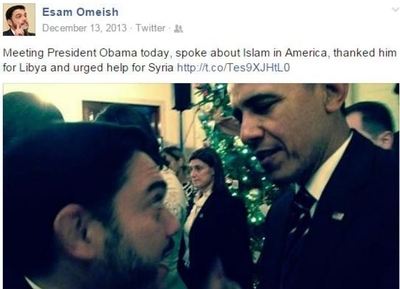 Omeish was responding to a posting by Hani Elkadi, co-founder of Egyptian Americans for Freedom and Justice and Egyptian Americans for Democracy and Human Rights. Elkadi seemed to admit his own Brotherhood affiliation on Facebook in a March 9, 2015 Facebook post showing an cartoon of a man holding a sign with the Brotherhood logo and the words which translate to, "I am [Muslim] Brotherhood and I'm not threatened." Omeish visited the White House and State Department numerous times and posted pictures of himself with President Barack Obama and Secretary of State John Kerry on his Facebook page. State Department officials featured Omeish in a 2008 video about American Muslims. In February, Omeish sent an open letter to President Obama asking him to support the al-Qaida linked Revolutionary Council of Derna. He endorsed the Muslim Brotherhood branch in his native Libya in a 2012 IRIN News article, saying that although it came in a distant second in Libya's 2012 elections, it "may be able to provide a better platform and a more coherent agenda of national action."